Through the lens of functional pottery, Justin Donofrio focuses on questions about people’s relationship with objects. He explores the ephemeral beauty of wet clay and the record of construction as a form of time materialized. Focusing on the fluidity of process and materials as remnants of making, Justin works with a limited number of tools and movements to allow the clay to actively inform line quality and volume. Relying heavily on the physicality of his technique, he generously pushes and pulls these lines to develop undulations that resemble natural rhythms. 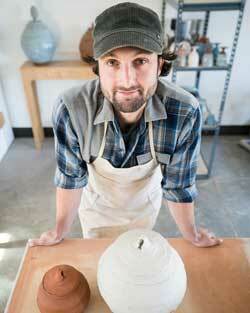 Justin grew up in Santa Cruz, CA, where he was introduced to pottery at Cabrillo Community College. Participating in Colorado’s vibrant community of artists, he continued his clay education with the support of Anderson Ranch, The Carbondale Clay Center and The Studio for Arts and Works (SAW). Ultimately, he completed a BFA from Colorado State University-Fort Collins in 2016. He is nationally represented in galleries throughout the U.S. and was selected as one of Ceramics Monthly's 2018 Emerging Artists.